It’s a skill both my hubby and I lack and it appears to be a trait we are sharing with our children. I try to make organization (and not procrastinating) a priority, but the moment I slack off, all my organizing efforts go straight out the window. One of our target goals this school year was to work on our morning routines and getting out the door without any raised voices or tears. Part of getting out the door with everything we need and smiles on our faces can be attributed to significant preparation on Sunday evenings and each evening before school. Our evening routine is packing lunches, putting together backpacks and leaving them by the door, making sure all school devices are charging, laying out clothes and locating both shoes before we go to bed. Our Sunday routine includes doing laundry, getting clothes put away and school outfits laid out and ready to go for the entire week. 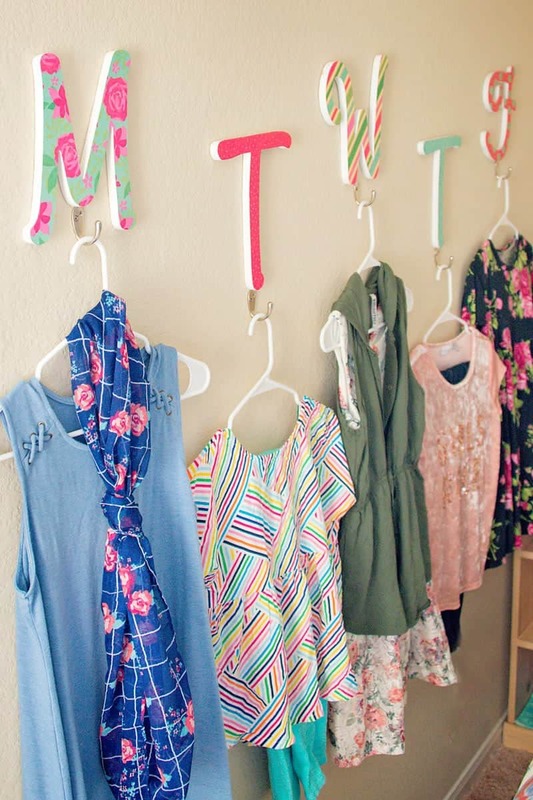 To make it fun, (and add a little wall decor to a blank wall) I made these adorable paper covered Day-of-the-Week Clothes Hangers for my daughter’s room. I just love how they turned out. 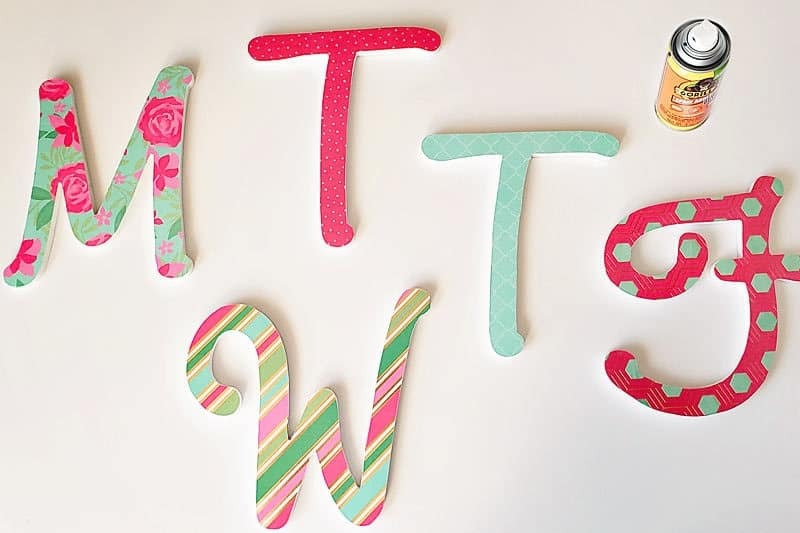 The letters were incredibly easy to make and the options are endless! The beauty of this project is that, based on your chosen paper and letters, this could work for anything. Names, holiday sayings, whatever you can think of! 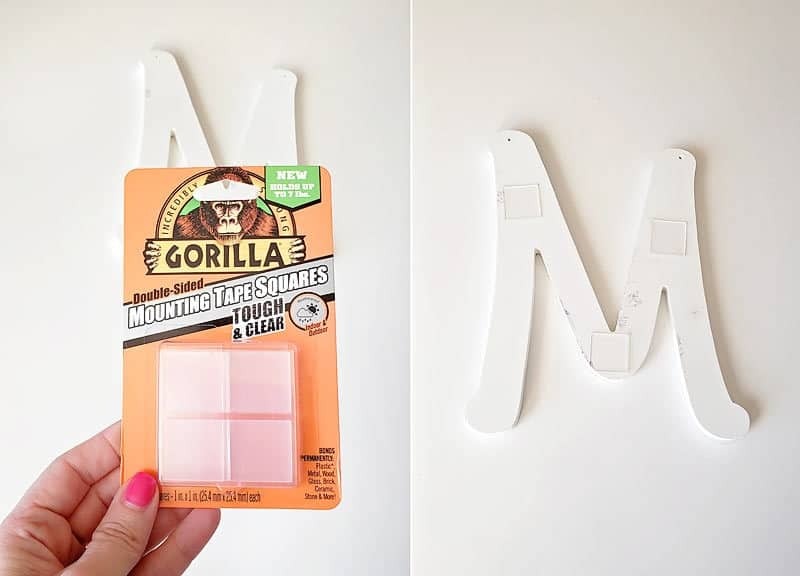 To make the project even easier, I used the Gorilla Spray Adhesive to attach the paper to the letters and the Gorilla Glue Mounting Tape Squares to attach the letters to the wall. 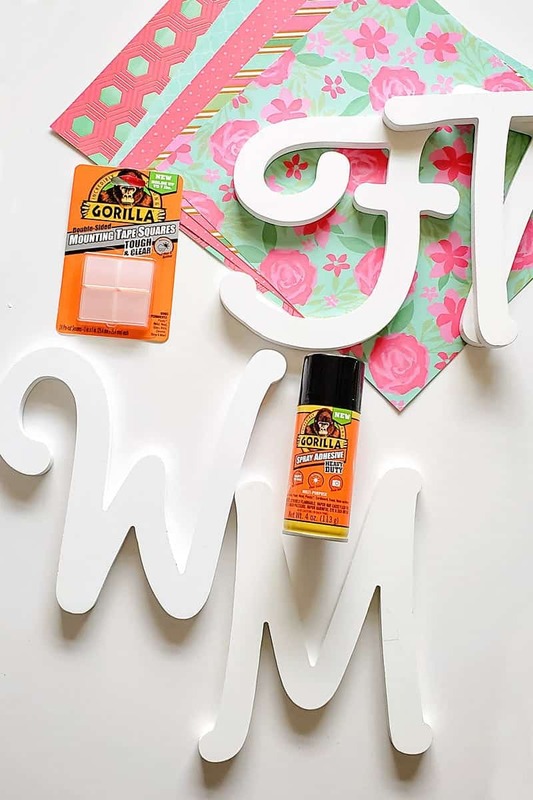 The Gorilla Spray Adhesive is a heavy duty, multi-purpose spray glue that is super easy to use. It is repositionable for up to 10 minutes and forms a clear, permanent bond that is photo safe. The wide pad nozzle and controlled fine mist provides an even application on your project, which is perfect for adhering cardstock to flat surfaces. Ready to make some of these paper cover letters for yourself? 1. Cover your workspace with paper. 2. 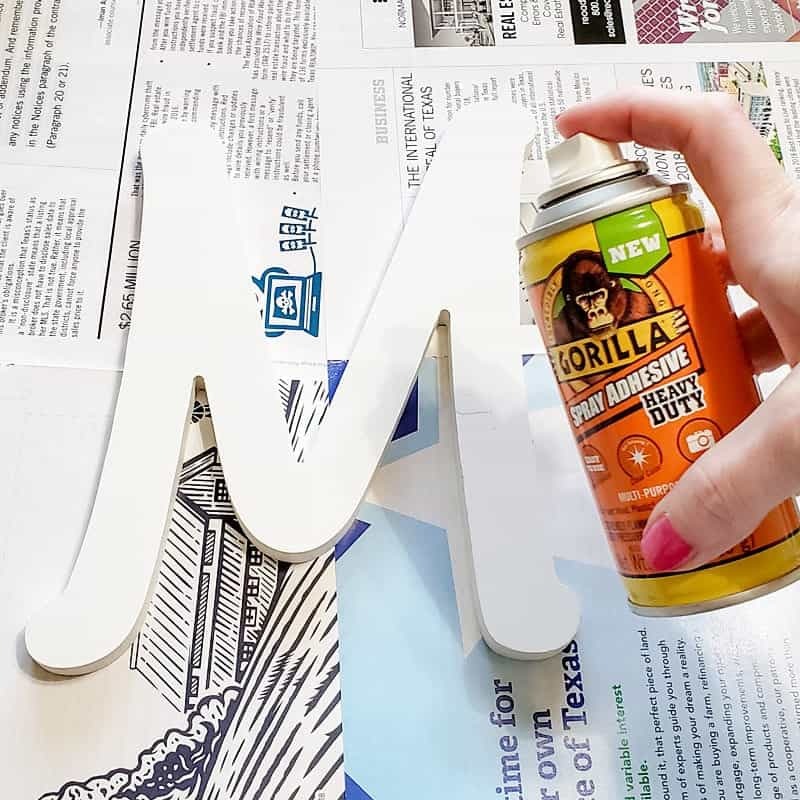 Evenly coat the front of the letter with the Gorilla glue Spray adhesive. 3. Let dry about a minute and flip letter over and press onto the back side of the cardstock. 4. 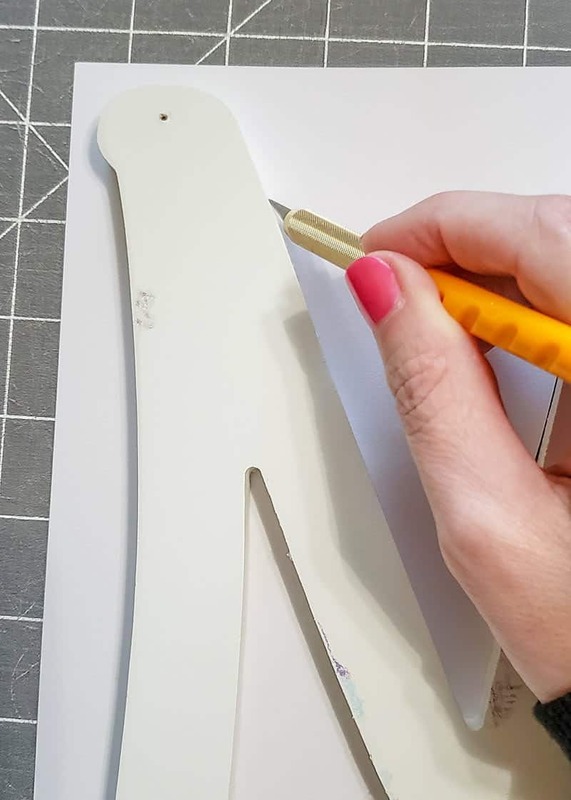 Use an art knife to cut along the edges of the paper. 5. 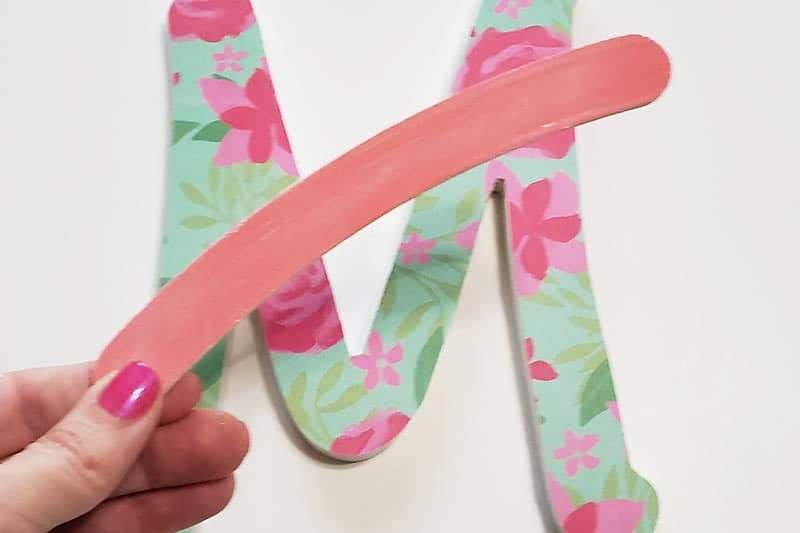 Smooth any edges with a nail file. 6. Repeat with the rest of your letters. 7. 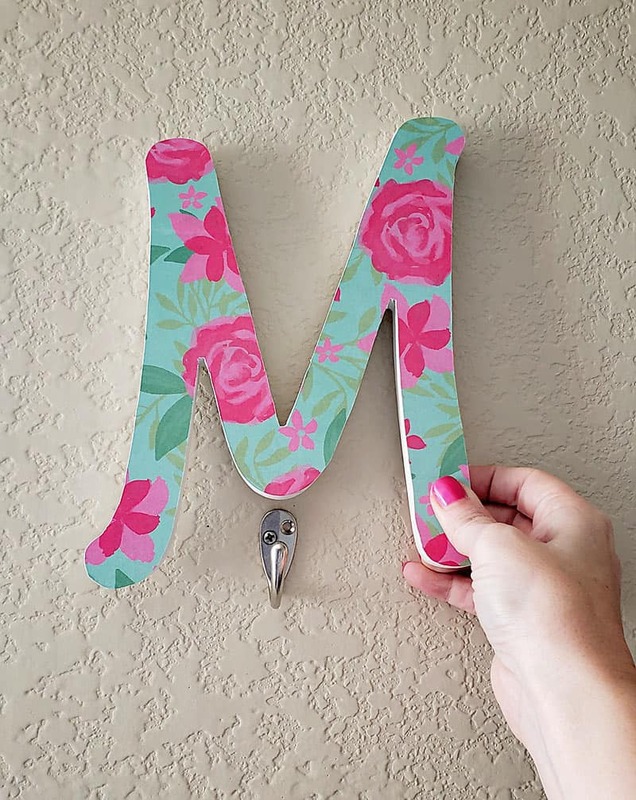 Decide the placement of your letters and hooks. Hang the hooks. (I used the drywall screws that came in the package. 8. 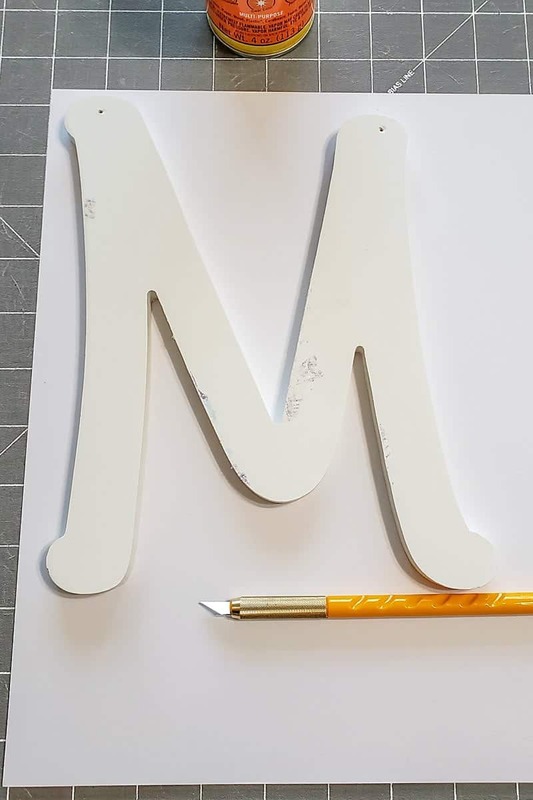 Add the mounting tape to the back of the letters. 9. 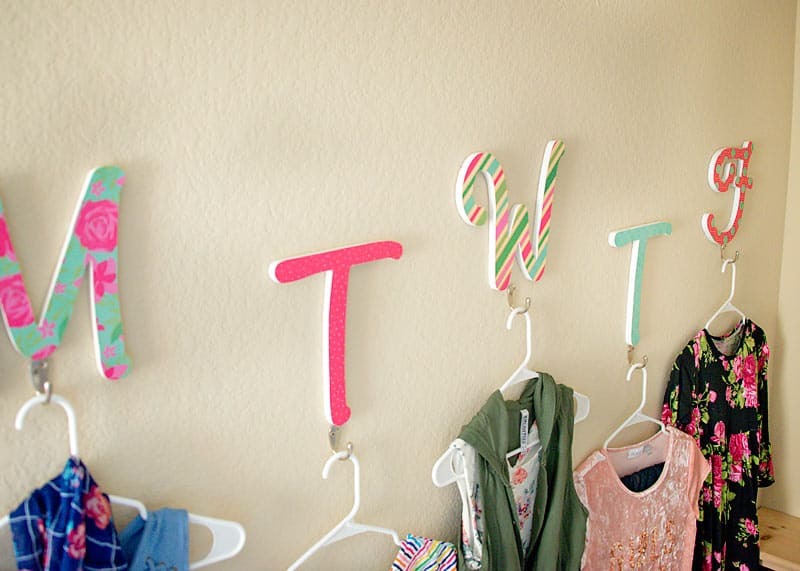 Hang letters on the wall. Now it’s your turn! Share your favorite way to get organized in the comment section below and be sure to fill out the entry form for a chance to win a $250 Home Depot Gift Card from Gorilla Glue®! This is a fantastic project – would love to make them for my grand daughter. Clever and easy. I like to hang all the parts of an outfit on a single hanger in the closet. I can’t leave clothes out since one of my fur babies eats fabric. This is adorable and a good idea, too. I’m a list person, keep too many, but always have one that is specific for the day (or if updating at night for the next day). I do try to figure out clothes and lunches the night before, too. Nothing as cute as your ideas! That’s a cute idea. I wish i had good organizational skills. I think my main goal is to return things to their places! I am the same way!!! We bought a mesh over the door shoe organizer for the kids’ mittens, hats, scarves, etc. It makes it easier to find what they need and keeps the mess off the floor. This is a really clever idea! 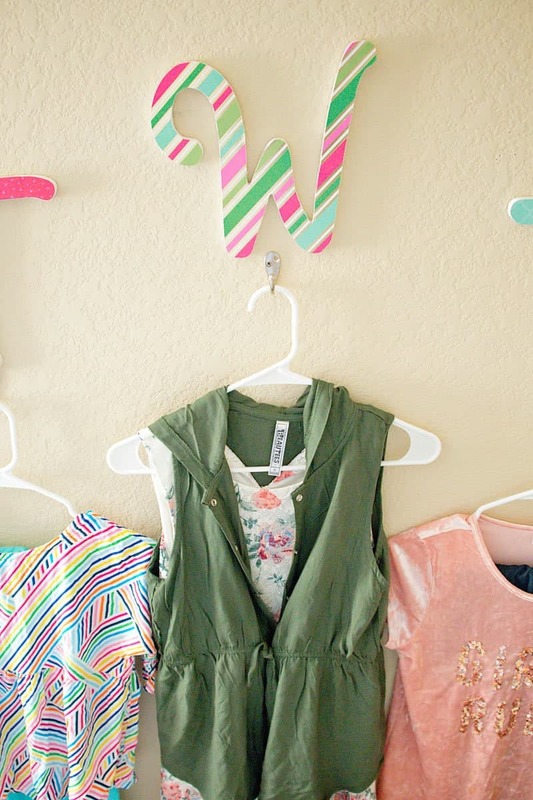 I would love to make this for my two fashion diva nieces! It would be perfect for them both! So clever and easy! Im going to do this ! This would be great for my kids! I love this!!!! It would be so handy for when I’m not there to help my husband get the kids ready for school. An amazing way I can encourage my niece and nephews to enjoy organising! Would love to organize the kids’ room like this! Thanks for the great idea! My favorite way to get organized is to purge so there is less that needs to find a home. In our entryway we have a shoe rack that we all put our shoes in. We don’t wear shoes in the house, and before we had the rack, there was shoes strewn all over the entryway. In the kitchen, each kid has their own shelf in the cupboards for their plates, bowls, and cups. That eliminites any arguments over, “He is using my cup”. I love creating or buying shelving to help get more organized! We’ve started buying multi-use furniture recently so as to create more storage space in our tiny home! My current favorite purchase is a storage ottoman that functions as both a seat and footrest but when you turn the top upside down, it functions as a tray table! What a great idea! Will have to show my daughter for their children. What a great idea! I love how yours turned out-so bright and cheery! This is such a great idea! A fun, practical way to organize. I’m not an organized person either so I have to work extra hard at it and I’m glad for any tips! I do like to use bins in closets tho to keep all our stuff separate so it doesn’t become one big jumble..
really clever, and a great way to get laundry put away first. What a great way to reduce morning chaos, and a lovely giveaway, thank you! Organization is always a struggle in our household, as well! Love this idea vs. having their clothes for the week folded, as it reduces wrinkles! How creative and cute! Would definitely be an asset to get organized especially during this busy season. I love Gorilla Glue and I love being organized. 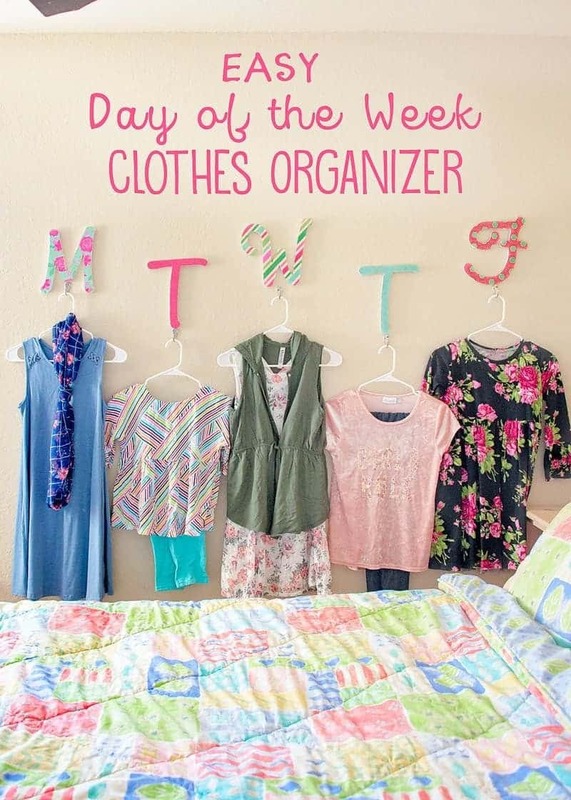 What a fun way I can help my granddaughters organize their clothes for the week. The are 12 and 14 and quite up to doing this. Thank you, thank you, thank you! What a quick, easy project. Not to mention cute. 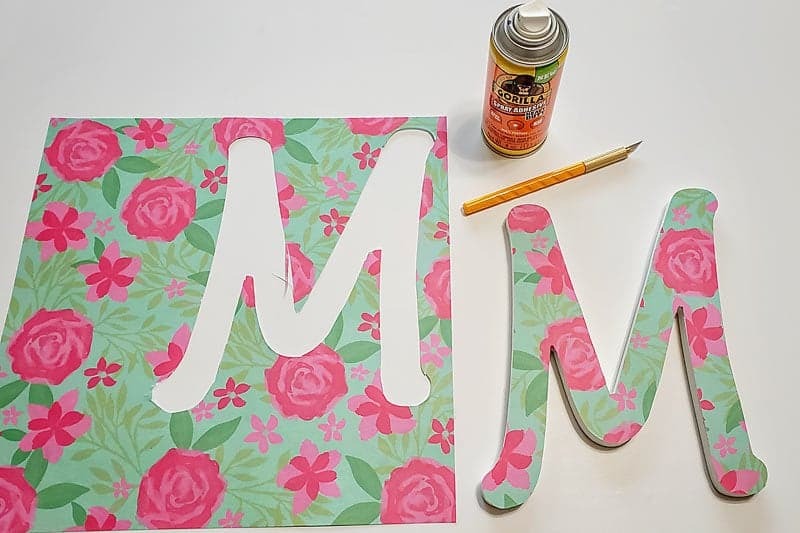 What a cute project and it looks easy to do. These are so cute! I’m gonna make some for my daughter’s bedroom! What a cute and smart idea! I wish someone would have suggested this when I was raising my four kids! I’m going to pass this idea on to my children to help organize my grandkids. Thanks for your nifty idea! Fantastic! Inspired to figure out a condensed version for my small room – this is an idea my toddler would adore!